The 12–14 March 1993 “Storm of the Century” (aka “the ’93 Superstorm” or “the Great Blizzard of 1993”) was one of the most significant storms to impact the eastern United States (NWS Wilmington NC summary). McIDAS images of EUMETSAT Meteosat-3 Infrared (11.5 µm) channel images (above) showed the storm as it initially began to experience rapid intensification in the Gulf of Mexico on 12 March. At the time, Meteosat-3 was on loan to the US and serving as the “GOES-East” satellite after the failure of GOES-6 in 1989. On the following day (13 March), a larger-scale view of Meteosat-3 Infrared (11.5 µm) images (below) revealed the very large size of the storm as it moved along the Eastern Seaboard of the US. Some highlights of the storm included snowfall amounts as high as 56 inches at Mount LeConte in Tennessee, a wind gust to 144 mph at Mount Washington in New Hampshire, a minimum sea level pressure of 28.28 inches at White Plains in New York, and a post-storm record low temperature of -12º F in Burlington, Vermont. The corresponding large-scale view of Meteosat-3 Water Vapor (6.4 µm) images (below) showed the well-defined dry slot and large comma head associated with the storm. 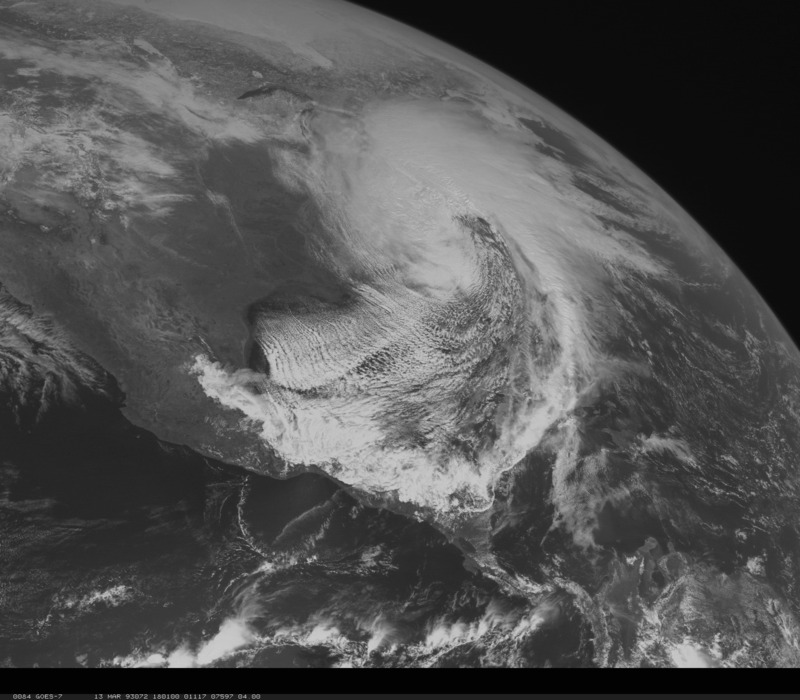 A GOES-7 Visible (0.65 µm) image at 18:01 UTC or 1:01 PM Eastern Time on 13 March (below) showed several interesting aspects of the storm, including widespread stratucumulus cloud streets over the Gulf of Mexico and the Atlantic Ocean (due to cold air advection over warmer waters), and also a large cloud arc in the Pacific Ocean south of Mexico, which was the leading edge of a Tehuano mountain gap wind event (see Schultz, et al, 1997). A rope cloud marked the leading edge of the strong cold front, which at the time of the image had plunged as far southward as Honduras in Central America. The Halloween Blizzard of 1991 was an early-season storm that moved north from the Gulf of Mexico to the upper Great Lakes. Unseasonably cold air allowed the rich moisture-laden airmass to deposit a long band of snow from the Panhandle of Texas northeastward to western Lake Superior. Many early-season snow total records were broken, and single-storm records fell at Minneapolis (28.4″) and Duluth (36.9″) Typically storms from the Gulf of Mexico do not move due north; however, eastward motion of this system was blocked by a large nor’easter off the coast of New England (the so-called “Perfect Storm”). In the visible loop above, notice the rapid melting of snow deposited by the system in the Texas Panhandle, despite record cold (30 and 31 October 1991 are the only October days in Amarillo history when the surface temperature stayed below 30 F all day). Snowcover in South Dakota (the Missouri River stands out) also speaks to the chill in the airmass on the cold side of the storm. A larger-scale visible animation is available here.